The bench grinder is the staple of a seasoned DIY’r. It’s the perfect tool for bring your bladed tools back to life. What we’re going to show you is how to choose the best variable speed bench grinder for your needs. We’ll look at benefits and features of a few of our favorites. What makes up a the best bench grinder? Our pick for the best variable speed bench grind is the WEN 4280 5 Amp 8" Variable Speed Grinder. The WEN is grounded with a solid cast iron base and comes with dual eye guards and an adjustable lamp light. Couple that with one of the best warranties in the market we feel this is the best choice for the consumer. The WEN comes with a 5 amp motor and ranges from 2000 to 3400 RPM giving you the choice of a precision sharpen or a blast. Slower speeds bring control while higher speeds clear material. This model comes with the choice of an 80 grit and 36 grit 8 inch by 1 inch grinding wheel. One for quick material removal the other for fine sharpening your tools. The WEN comes with an adjustable work light to brighten up your workspace. This also works as an additional safety measure. This grinder is equipped with a heavy cast iron base for stabilization. It also is equipped with pre-drilled holes in the base for easy mounting. This model is designed with the consumer in mind with the easy wheel guard removal for wheel changes. The added eye guards are built in to keep the operator safe from unexpected projectiles which might kick up from the wheel. The WEN product line comes with a 2-year WEN backed warranty and nationwide customer service and skilled technicians readily available. The grinder comes with an easy to use speed knob for adjusting to different wheel speeds. Additionally, the power switch sits right beside it for ease of use. The TruePower comes with a built-in flex shaft perfect for deburring, polishing and grinding down materials. Its compact nature gives it a unique edge in the workspace. If you’re tight for room this might be the perfect choice. The 31-inch flex shaft is great for hard to reach surfaces and pair that with variable speed control you have amazing precision. Dual grinding wheels come along with this compact model; 3 inch grinder stone and 3 inch fiber wheel. This gives you the ability to grind off rough surfaces and have precision sharpening. The TruePower comes with surprising power and can run up to 10,000 RPMs. The adjustable speed control knob gives you the freedom of speed control for effective grinding. This model comes with an additional add on eye guard to protect the operator from wayward projectiles during use. Additional mounting accessories are included in the set, two wrenches and a mounting knob. With the grinder wheel, polishing wheel, and flex shaft all included on one machine. With the TruePower you should be able to knock out any item. To give you the best stabilization this compact model comes with a sturdy base. Its size allows you to put it just about anywhere in your garage. The Porter-Cable grinder comes equipped with an adjustable work lamb, which is great for low-lit garages. It acts as an additional safety feature as well. Another key safety feature is the dual eye guards which come stock and can protect the operator from loose projectiles that might fling up in use. The Porter-Cable additional comes with tool rest made of aluminum that provide a precise polish or sharpen every time. This model provides a steady range from 2000 to 3400 RPMs, giving you the control to furnish or blast excess material. Additionally, to compliment the variable speed the Porter Cable provides two grinding wheels with two grit ratings of 36 and 80. The speed variable is controlled by an easy to read knob parallel to the power switch for ease of use and operation. The Porter-Cable comes with an amazing 3 year warranty with an additional 90 day money back guarantee. This model also comes with a thin housing profile which helps tackle larger items on the grinding wheels. The Craftsman comes with a variable speed range from 2000 to 3400 RPMs giving you enough range to get some unwanted burs off as well as running low enough for a smooth polish. An added feature that comes with the Craftsman is the eye guards. It doesn’t always come stock with other models, but it does with the Craftsman which is a big plus. The cast iron base comes with rubber feet to provide stabilization and vibration control during use. This grinder is equipped with tool rest to give you optimal control and a precision grind every time you operate the machine. The Craftsman comes with a stock water cooling tray to help prevent any burns from heated metal from the grinding process. This model comes with a hand-held wheel dresser which is a beneficial additional feature. The 6 inch grinding wheels give are perfect for everyday projects. Additionally, this model comes with easy change wheel guards which can save you time and patience. The Craftsman comes with a thin motor casing which allows you to slide larger material up to the grinding wheel. On the front of the grinder come with easy to use speed control knob and the power switch. This grinder comes with a one year warranty in case any malfunctions occur. For added value Craftsman provides one wire wheel and one grinding wheel included in the box. The Delta grinder’s variable speed ranging from 2000 to 3400 RPMs give us pinpoint control of the speed of your grind. You have the liberty to accomplish deburring or a smooth polish. The grinder is equipped with two eye guards to protect you from projectiles that might occur during use. The adjustable lamp is a nice touch and an added safety measure, perfect for low-lit garages. The speed variable knob is located next to the power switch; convenient and easy to use. The Delta comes with a 5 amp motor supplying plenty of power for all of your projects. The two-piece tool rest come stock with the grinder for precision grind for all your tools. Additionally, the left rest comes with a drill bit slot for your drill bits. The tool rest also come with adjustable mounts to help you accommodate for various tool sizes. This grinder also comes with an additional water tray which helps your workpiece remain cool while your working. This comes as an added safety measure as well. The Delta’s 8 inch wheels come with two grit ratings, 36 and 60 for a grinding and polishing. This grinder comes with a cast iron work base for optimal stabilization. Delta comes with a versatile warranty; 5 years for new machines and 2 years for accessories. There are few tools in your garage that can be called an investment. The bench grinder is one of the only tools in your arsenal that will in time pay for itself. 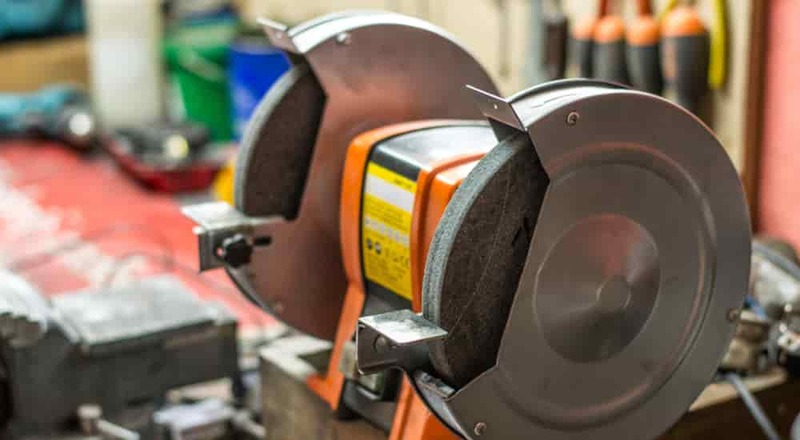 Not to be confused with its smaller counterpart the angle grinder, the bench grinder is primarily for sharpening not cutting. The variable speed bench grinder allows you to revive old tools instead of throwing them out. With that being said, not all variable speed bench grinders are the same. They come with various faucets for specific uses. What we aim to do is walk you through some things to look for when your purchasing a new variable speed bench grinder. There are a few similar components every bench grinder comes with. We’ll mention the standard parts and then a few common accessories that come stock with some models. Wheels – Bench grinders come with two wheels. One is a fine wheel the other is a course wheel. 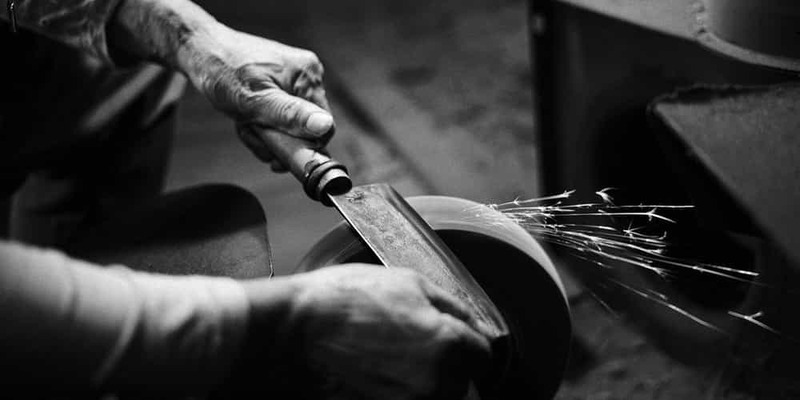 The fine wheel is used for sharpening and honing. The coarse wheel is used for stock removal and shaping. Wheel Guards – The wheel guards run over top of the grinding wheels and act as a safety feature. Motor – Each make comes with a different power output. The power of the bench grinder comes from the motor. Check the motor amps to get a feel for how much power you desire to work with. Eye Guards – During operation sparks and other material can fling upwards toward your face due to the high RPMs. Typically, models come stock with this part, but not always so this should come into consideration. Water Tray – This accessory is a little more hit or miss, but can be a hand saver. When grinding material it becomes hot, the water tray comes in handy a lot using this machine. Tool Rest – Like the water tray the tool rest doesn’t always come stock with your benchtop grinder. However, it’s a great feature and can help you gain and precision and control. The variable speed bench grinder comes in use most often for tool maintenance. When you need to sharpen or polish screwdrivers, chisels, knives, or even burr off some rough edges. As I mentioned earlier this tool has the ability to pay for itself over time. However, if you need to sharpen garden power tools like chainsaws, it's better to use chainsaw sharpeners instead. If you find yourself involved in a good amount of wood working projects. A bench grinder might be a great purchase. It’s ability to sharpen chisels and drill bits will come in handy because buying new bits to work with a drill or chisels may not cheap. The variable speed bench grinder gets its name from the ability to fluctuate to different RPMs. The main reason this model was invented was to give the operated various speeds so they can perform different task. For instance if you only had a one speed bench grinder it would limit its use to one aspect. However, because you can increase or decrease in RPMs you have the ability to either sharpen / polish material or bur and grind material. Additionally, you have the ability to change wheel types and grits. So, instead of having a one dimensional grinder you have a multi-dimensional grinder. Most variable speed grinders have a range from 2000 to 3400, or somewhere close to those speeds. This range of RPMs is more than adequate to handle any household projects. Choosing the correct grinding wheel is essential for an effective machine. You can find the recommended size and type of wheel for your grinder in the owner’s manual. Choosing a grinding wheel can vary upon, project type and grinding RPM. 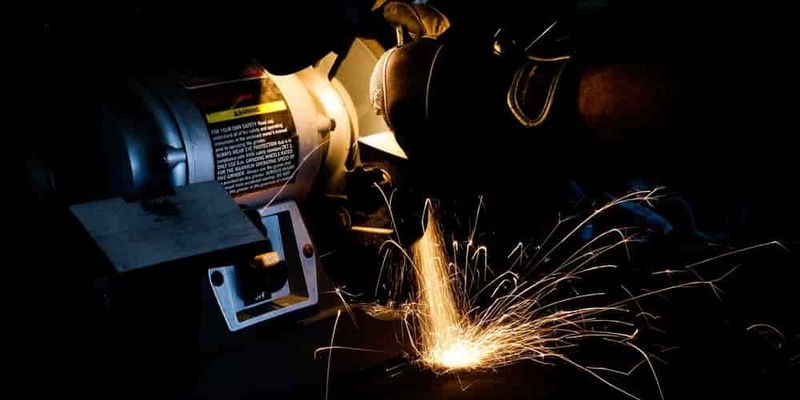 Here is quick overview of what elements that make up a grinding wheel. The abrasives are the material selected to do the grinding. For example, the abrasive on sandpaper is sand. The sand is glued to the paper to make up the component, a grinding wheel works in a similar manner to a benchtop sander. There a two types of abrasives conventional and super adhesive. From these two abrasives different methods of grinding wheels are constructed. Grit size refers to the density of the abrasive spread along the wheel. Grit also refers to the size of grain used on the wheel. The mixture of both density and size of grain make up the grit rating. To tie it all together comes the structure of the bond used to hold the wheel intact. There are two types of bonds, one a hard-grade bound and the other a soft-grade bond. Of these bonds different components which hold it all together, I’ll list a few of the common ones. Glass based – This type of bond is used in 75 percent of all grinding wheels. This type of bond works well up to 6500 RFM. Resin Based – The resin-based bond comes in a close second for quality and strength. Although this style of bond can soften in high heat. Works well up to 16500 SFMs. Silicate – Silicate wheels are used at low speeds and work best in low heat situations. On a benchtop grinding machine there are two types of wheels which come stock. One is the coarse wheel, which is used for burring of rough excess material. The other is a fine wheel used for polishing and finishing. When working with any power tool that oscillates at high speeds safety is the number one priority. With that in mind here are some key safety items to follow. Wear safety glasses when operating the machine. Even though some of the benchtop grinders come with eye guards it’s smart to wear them. If the benchtop grinder does not come stock with a water tray keep a saucer of water next to you. The workpiece can become very hot when being grinded. Before you power the machine on make sure you’ve fastened the grinder to a stable workbench. Additionally, before you operate your benchtop grinder read the owner’s manual so you have a well-rounded knowledge about your machine. Never tamper with your machine. Assemble just as the instruction manual advises. Like any machine it needs proper care and maintenance to operate efficiently. Here are a few things you can do to upkeep your benchtop variable speed grinder. Wheel Maintenance – Some models will come with a groomer, a little brush to run up against your grinding wheels. If your model doesn’t come with a groomer, you can buy one and keep it by your machine. If you noticed one of your wheels dulling change when needed. Cleaning – When working with any machine that disperses shavings it’s a good idea to sweep off the machine and three feet around the workplace. An effective way is to blow off the dust with an air compressor. Then come back over it with a cloth to get some of the heavier shavings. Check Machine – After every use it’s wise to do a quick inspection and make sure nothing has unfastened during operation. The benchtop grinder causes heavy vibrations by nature so components can come loose. Q: Can you use a bench grinder on wood? A: Yes, you can use your benchtop grinder for wood. Keep in mind you’ll want to use the correct wheel and appropriate RPM speed. Q: Which size bench grinder should I use? A: The size of the benchtop grinder is subjective to your needs. If you read some of the suggestions above this should give you some information to educate you on your decision. Q: How to change a bench grinder wheel? A: Every variable speed bench grinder is different. You’ll want to check in your owner’s manual. Most models have a simple change by removing the wheel guard, which will bare the wheel. Q: How to use a bench grinder to sharpen tools? A: In principle you’ll want to hold the desired tool at the appropriate angle and run it on the grinding wheel. Make sure to run at the desired RPMs. If this is your primary purpose for the machine be sure to purchase a tool holding attachment. We feel the WEN 4280 5 Amp 8" Variable Speed Bench Grinder is the best choice for the consumer. This grinder is backed by the WEN name and has a cast iron base to help reduce vibration during operation. Additionally, this model comes with dual eye guards and an adjustable lamp for added value. The TruePower 199 Mini Multi Purpose Bench Grinder is great choice if desire quality at an affordable price. This small model comes with incredible speed and has a unique flex shaft to help you get in tight spaces. If you would like to settle in the middle the Porter-Cable PCB575BG 8" Variable Speed Grinder is a great choice for you. This model has an assortment of valuable accessories as well as a 90 day money back guarantee.